The Steele Memorial Library is pleased to announce the UPCOMING addition of 5 new ukuleles to the library’s circulating collection. To celebrate we are offering a 3 class session of ukulele lessons taught by Crary Myers. (Thank you, Crary!) This first session of ukulele group lessons begins on Thursday evening, May 17, at 6:30pm and continues for the next two weeks on 5/24 and 5/31. Students attend all three classes in this session, all on Thursdays at 6:30pm in the Steele Memorial Library PC Lab on the first floor of the library. Class is limited to 6 participants. 5 ukuleles will be available for students to check out from the library, with a library card in good standing (less than $5 in fines). The 6th person will bring his or her own ukulele. This class is for adults and teens (ages 13 and up). Space is limited but if demand is great, we could potentially hold future classes and sessions. Please call 607-733-9175 for information and to put your name down on the list. 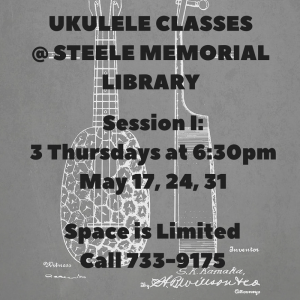 Ukuleles will be reserved in May for class attendees, but will be available for checkout to teens and adults beginning in June. (NOTE: Ukuleles are not available for checkouts or holds at this time). Also available to all library patrons: lynda.com is a learning database available through our website which offers a video ukulele class. This database is free to all CCLD card-holders. To get to lynda.com from our website, go to ccld.lib.ny.us, then go to Resources>Databases & E-Resources>Classes Online>then click on lynda.com. If you haven’t signed on before, you will be asked to create a free account with your library card. This entry was posted in Uncategorized by Maggie Young. Bookmark the permalink. That is so cool. If you of any libraries in Delaware County PA PLEASE let me know. Just so cool! I am 60+ y/o and would love.to learn the ukulele. Next → Next post: New books at Steele–place your hold today!